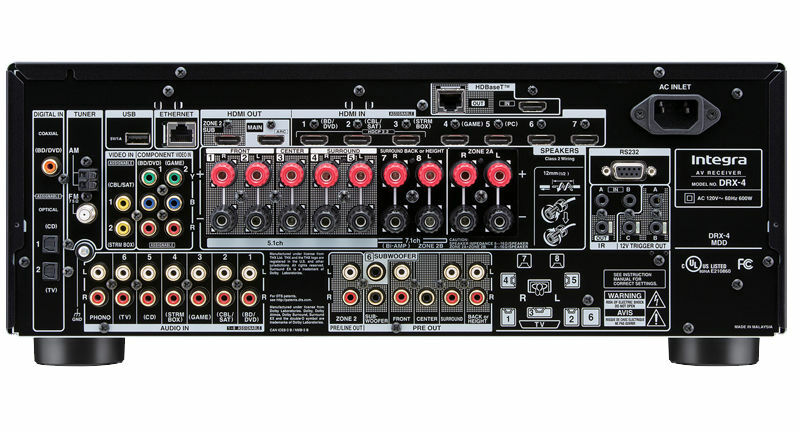 The DRX-4 amplifies accurate, noise-free signal processing with high-current power for dynamic speaker control. The result is pure, rich and authentic sound. Integra’s dynamic audio amplification delivers 110 Watts per channel (8 Ohms, 20 Hz–20 kHz, 0.08% THD, 2 Channels Driven) with 35 amps of high instantaneous current capability. 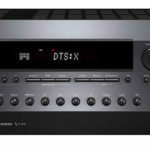 The DRX-4 is certified Select2 Plus by THX. THX spends 40-60 hours testing over 2000 data points ensuring that the DRX-4 is capable of meeting rigorous audio and video performance standards for reference level, distortion free playback and includes THX Loudness Plus technology to bring out intricate details at lower listening levels. 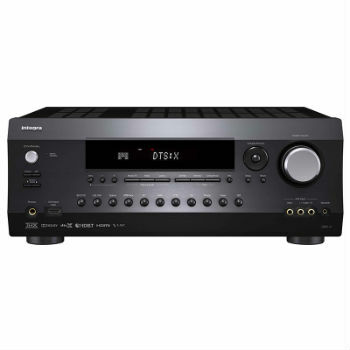 The DRX-4 features Powered Zone 2 with A/B speaker selection to bring audio to speakers connected to the receiver into a second room or third room. 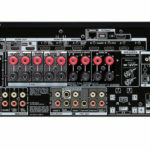 Zone 2 Pre/Line Out can be used with an outboard amp, and a Zone 2 DAC for HDMI Inputs 1 through 3, Coax and Optical Inputs (2-CH PCM), Network (including Pandora and Spotify), and USB audio sources. There are also maximum power and power on volume settings for the Main Zone, Zone 2 as well as bass/treble and balance controls to further customize your listening experience and help get the best performance out of your speakers. The DRX-4’s HDMI specifications and HDCP 2.2 compatibility support the latest formats being released by Hollywood. The latest HDMI specs offer a significant increase in bandwidth (up to 18Gbps) to for full UltraHD support of features such as 4:4:4 color space and 4K@50/60 (2160p), which is 4 times the clarity of 1080p/60 video resolution. The DRX-4 enables transmission of High Dynamic Range (HDR) formats, with BT.2020 support, and provides enhanced picture quality by simultaneously enabling greater detail for both the dark and bright parts of an image. The DRX-4 also effortlessly upscales 1080p video to stunning 4k UltraHD. The DRX-4 has Chromecast built-in for Audio and Airplay technologies built in. Stream virtually any audio from a smartphone, tablet or PC to your home theater for powerful sound. With Spotify, Pandora, Deezer and TuneIn built-in, you can select a station and search for music available on these services via the Integra Control Pro app on your phone. The free Integra Control Pro app puts a range of streaming options at your fingertips, from universal hi-res audio via network-attached devices to internet streaming services to music on your smartphone and tablet. The Integra Control Pro app for iPod touch®/iPhone,® Android, and Kindle devices is a convenient way to control your home entertainment from anywhere within wireless range. The app has a clear graphical interface to control playback, adjust settings and handle content across multiple zones. The app serves hi-res, lossless, and compressed audio files (including 192 kHz/24-bit FLAC, DSD, Apple Lossless, Dolby® TrueHD and more) to the DRX-4 from your mobile devices, and gives it stunning sound. No matter what you’re listening to, it will sound powerfully full, clean and clear. A premium-quality AK4458 digital-to-analog converter from Asahi Kasei implements unique low-distortion filtering technologies for clear sound, and unlocks the full potential of any audio format, including compressed, lossless, and hi-res audio (MQA, MP3, WMA, FLAC, WAV, AAC, Apple Lossless, AIFF, DSD 11.2 MHz, and Dolby TrueHD).